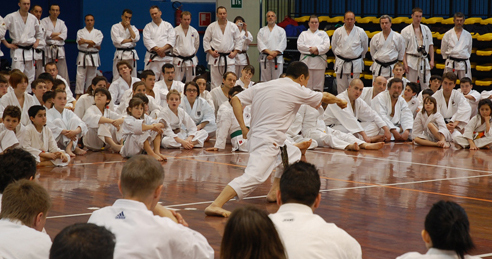 The KWF would like to post a summary of the KWF European Camp, the KWF Honbu’s first seminar in Europe, which ended successfully. 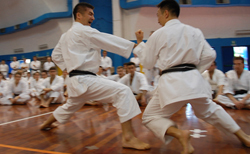 In the pursuit of the one finishing blow, the KWF places the highest emphasis on koshi kaiten or hip rotation and shinshuku (maximum) compression and (explosive) expansion. 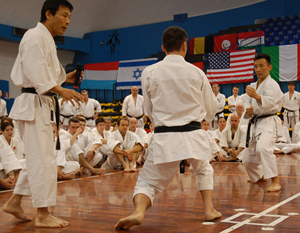 Of course, over just two days, it would be impossible for everyone unfamiliar or not trained with these concepts to completely understand and master such techniques- however we do imagine that participants were able to understand that Karate is not about using just the arms and the legs, but that Karate is about harnessing, focusing and using the body to create explosive power. 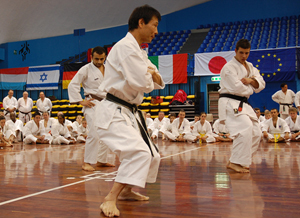 We do hope that for those who participated who have not been exposed to this Karate, or who only been exposed to sports Karate, which has departed from the main essence of Karate, that the KWF concept of Bugei or Martial Arts Karate based on the Kihon of koshi kaiten and shinshuku will have made a fresh impact on you. The next part of the seminar focused on the compression of the rear leg and its role in the performance of the correct oi-zuki. It is vital that at the moment of kime that the hips are in gyakuhanmi and that the whole body holds correct “five point” form- i.e. correct form with the punch, the hikite, the front leg, the rear leg- particularly focused on maximum extension, and the hips. 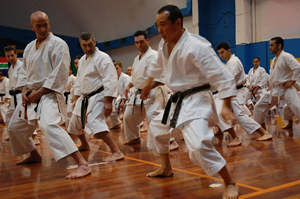 After gakuzuki and oizuki, we practiced how to perform correct kihon Kumite. It did seem that so many people standing in front of their opponents forgot their basics, their kihon. This is something we will talk about later, but correct kihon is vital whether or not you are practicing with an opponent, and you must maintain correct kihon whether you have an opponent or not. This is an eternal theme with Karate. Following kihon Kumite, we next practiced Heian Shodan. 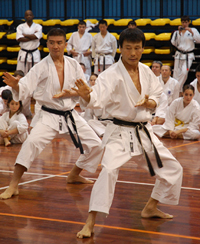 This practice focused on making sure to correctly perform hanmi and shomen, emphasizing the differences between them. 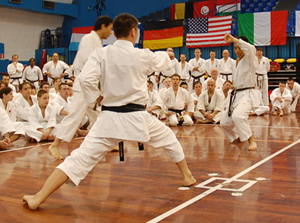 Amongst all the kata, Heian Shodan is the most important kata not only for KWF but for Shotokan Karate: KWF’s performance of Heian Shodan contains the essence, the core, the quintessence of the philosophy of KWF Karate. Also, focusing on the application of koshi no kaiten, Yahara and Kawasaki Senseis also performed Bassai Dai. We do hope that you were able to see that all the movement was focused on the hips. 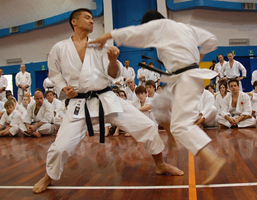 In the afternoon, we practiced correct compression and (explosive) expansion and its role in correct Kumite. 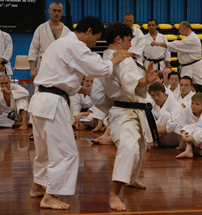 Being able to understand and perform this is the key to unlocking an understanding of the key of the Seminar, how to perform Ippon Waza. 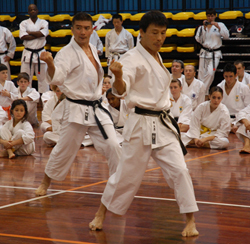 We began with Kawasaki and Takahashi Sensei performing a display of correct jiyuippon Kumite. We hope that you were able to see that at all times, when moving freely in jiyu kumite, or at any point in a waza, including kime, you never leave kihon form. 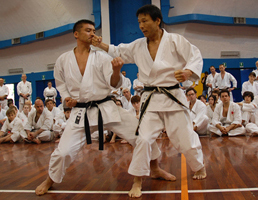 Within Kumite, kihon waza is maintained and within that the correct use of the body is necessary to for the mechanics of the body to work powerfully and efficiently, and this is achieved through correct shinshuku. We felt that that the Honbu instructors provided model examples of the use of shinshuku in oizuki and gyakuzuki: a point we felt interesting from a different angle is that these movements these seemed to be new movements not seen before to those who were not KWF members. 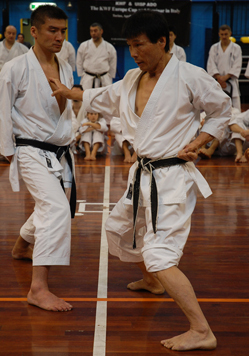 At the point of kime, the rear leg must be extended to the limit and the koshi (hips) must be in gyakuhanmi, and with the correct focus on balance, this generates an explosion of power. Then as soon as kime was created momentarily, the rear leg has to bring back to the preparation position for preparing the next motion. When you “get it” you realize how very logical, dynamic and efficient it is- however, it is not so easy to do at first if you are not experienced with these kinds of movements. On the second day we focused on a developing a thorough grounding in shinshuku, and to do this we moved to partner training with jiyu-ippon kumite. 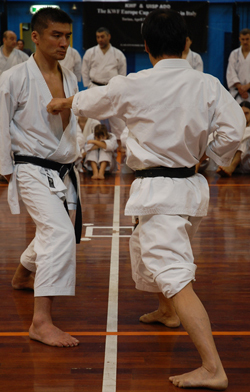 The concept of one finishing blow and one block and finishing counter attack- this is the essence of Bugei Karate. We practice compression and explosive expansion in order to develop the power to deliver this one finishing blow. 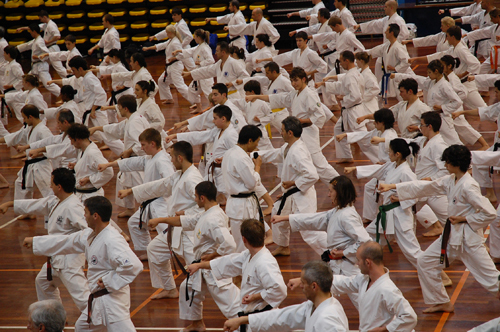 The last session of practice was on Kaiten-Ura-uchi-Ken (reverse rotation punch). One of the main exercises is to use all your body, in perfect balance, from your foot and ankles, through your waist and upper body through your back and into your fist to generate power. This technique requires also high level of control, sense of balance and the ability to coordinate and harmonize your body’s hips, toes, ankles, knees, back, shoulders, arms and so on into a powerful weapon. Seeing Yahara Sensei’s technique of this Kaiten-Ura-uchi-Ken against Kawasaki Sensei must surprised the participants. 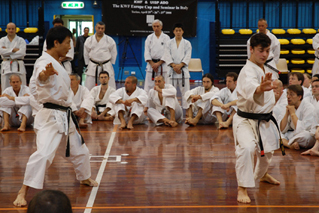 While KWF Karate is focused on kaiten and shinshuku, the method behind this it the ability to correctly move your center of balance, and this awareness of the center of gravity and the ability to shift the center of gravity correctly is found in Isaka Sensei’s training. 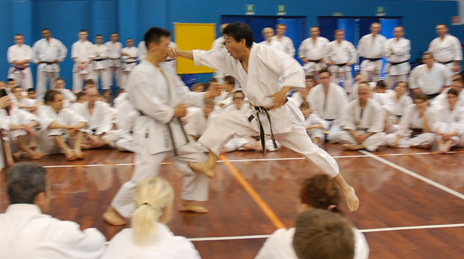 We think everyone was surprised to see Isaka Sensei’s slow motion training and that shows how to shift the center of gravity and be in control of your body for maximum power to turn to attack an opponent from any direction. 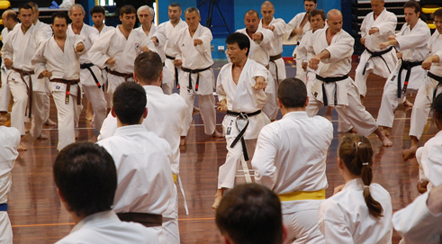 Ultimately, what KWF showed in this seminar is the critical importance of using all the elements of the body correctly in order to generate explosive power as Bugei Karate technique. KWF approaches this path by training that teaches a real sense of control of the body and building correct muscle us. Hopefully, we were able to pass several, if not all these messages to participants. We would, finally, like to thank all of you who took part over the two days, and wish you good training. Those who participated in the Seminar for the full two days (both days) received a service point, which was added to the points they were awarded in the Dan Examination. Those candidates marked “*” passed the Examination without the service point. Thank to all the participants who joined the KWF 2008 European Camp. The seminer video will be shown on the KWF web site at the end of June. For people who would like to receive further infomation, please join our mailing list. 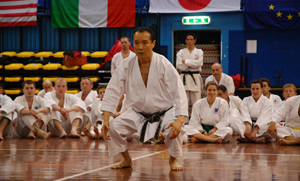 We hope to see you again at the next KWF WORLD CUP in 2009. Copyright 2006 KWF All rights reserved.